There’s a scene in “Up in the Air” where Clooney enters an airport security line and smoothly kicks off his shoes, twists his bag around to slip out his computer, and breezes past the TSA employees with the cool ease of a man whose 100% been there before. After taking my bike on several flights this past decade, I knew that I could be that guy. While past experiences left me at a ticketing counters with a film of dew over my eyes and perhaps a sniffle of the nose on the curbside of the airport pickup line… this time was going to be different. I prepared more than ever before; Suzie and I called all the airlines to confirm we were taking bikes with us on the plane, we arrived 4 hours before our flight to properly prepare them for takeoff, we ensured any hazardous materials were in our checked luggage (for some reason the “Bear Grylls Hatchet” isn't permitted in the cabin? ), and everything was on time. I … was going to be the Clooney of this adventure. If there was a way to use an onomatopoeia to spell out the “failure tone” they use in the “Price is Right,” I’d really like to do that here. I was wrong. I wasn’t Clooney. I wasn’t even the guy behind him in line in that movie. 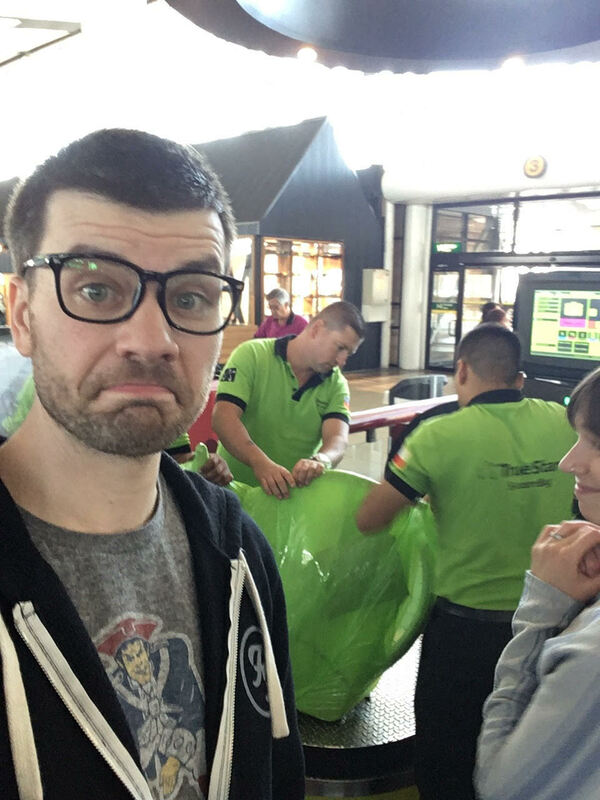 I was just… me, again, at the airport, a single red balloon in hand while asking the ticket agent… “but why!” The first day of our great adventure decided to be one where the universe tested our patience and ensured it was calloused enough to endure the road ahead. I’ll admit that the very start wasn't so bad at all. 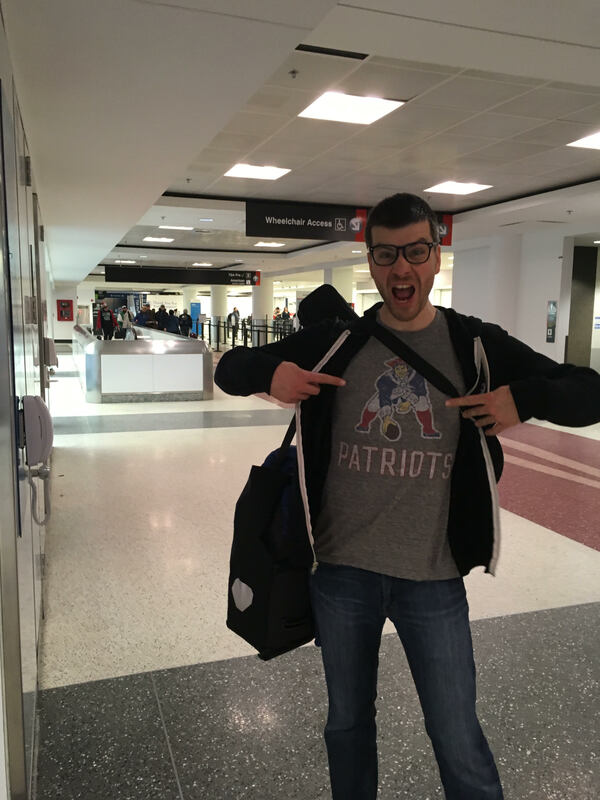 I mean, the Patriots (my favorite American football team) won their sixth Super Bowl the night before and my parents and brother generously drove us to the airport, allowing us one more chance to bid farewell to them before leaving for a while. Also, I wasn’t lying above when I mentioned showing up hours early and being extremely well packed. So where did it all go wrong, you may ask? We we made it with relative ease from Boston to Miami and then Miami to Santiago. I hadn’t looked at… well really anything at all about the flight details beforehand, so I do admit that the length of these was surprising at 4 hours and then 8, but besides that, everyone was helpful in checking things onto the flight and we thought we were gold. Then came our last layover in Santiago. Since we were entering Chile and connecting domestically, we needed to go through Immigration and Customs on this leg. Upon learning this, I wasn’t too worried since we had 3 hours to kill and the ticketing agent in Boston assured us they would check the bikes through to our final destination: Puerto Montt. So, nothing to worry about. After leaving Immigration and collecting a shiny new stamp in our passports, an agent directed us to baggage claim where we needed to collect our checked items and check-back-in/go through security. I was left stunned and a little less than pleased. But, so things go on a cycle tour, and we kept a smiling face on. Our bikes were the last to be offloaded at the chaotic baggage claim area, but we luckily had the help of our new friend Jared who we met on the plane and was connecting flights/equally confused as we were. 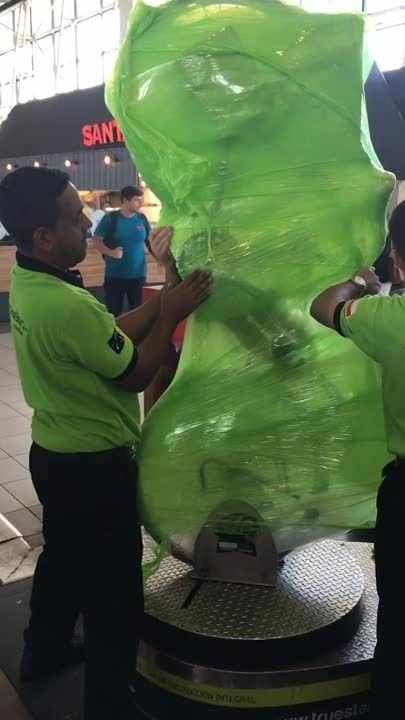 As the clock ticked down to our flights departure, I dead-lifted both of our wrapped bikes, which we couldn't wheel because they were in bags with the tires deflated, through the airport and into customs. You know those windy, absolutely ridiculous, lines at the bank where you need to still weave back and forth to reach the Teller, even though you are the only one there? Now imagine that with a bike under each arm. Not so fun… but still, and always, hysterical. Even after clearing customs, an agent stopped to ask for the bikes serial number to add it to their documentation. The bikes… serial number? This isn’t a Hyundai or AK-47… it’s a bike. I almost made a joke that I had scratched it off, but held back because of… well.. I guess I didn’t want to spend a night in the penalty box. Fast forward another 10/15 minutes of walking, and we finally reached the check in (but really… re-check-in am I right?) point to get on the last flight. Suzie’s B+ Spanish helped a ton, but the agent at the counter had no idea what to do with 2 fast talking, semi-rushed Americans trying to get their bikes checked onto the plane. Also, bear in mind that these bikes had been on 2 flights and were a bit worse for the wear. Also, bear in mind that both flights had lots of movies to choose from, so I hadn’t exactly slept in a day and a half. When all was said and done, they told us we got wrong information and could not bring our bikes with us on the plane. Yup, they said it was not possible. Obviously, we protested and tried better to explain ourselves, and they did get a manager to confirm that we were misinformed. I’d call this “the low point” of our airport excursions thus far. I’ll admit to reaching the point were my cool was slipping away, though I give Suzie a ton of credit for keeping it together. After more protesting, we learned that they were more afraid of the bikes damaging their equipment than anything else. So, they proposed we find a way, within 20 minutes, to make them more secure. While I titled the post “Airport Blues” it really wasn’t all that bad. A day later, it’s actually really funny how it all went down, and we are just grateful to have made it in one piece to Puerto Montt. The face on the attendant's faces when we asked them to use the packing machine on 2 touring bikes was also priceless. The bikes did need to get re-tuned, and I did need several glasses of wine once we finally put them together and biked into the city from the airport… but we are all smiles now :) When all is said and done, it could have been a lot worse. I mean… they could have asked me to get into that wrapping machine!